While most of our work to date has been concerned with physical activity, obesity and asthma, the built environment can also shape injury risk. Nearly 5,000 pedestrians in the U.S. are killed by motor vehicles ever year, and a small number of high-risk intersections account for a substantial proportion of vehicle-pedestrian collisions. Modification of the road and pedestrian environment where collisions occur is an attractive potential intervention both to save lives and to promote pedestrian and cycling activity (active transport). Previous research on the relationship between pedestrian environment characteristics and collision risk has uncovered counter-intuitive findings, including that crosswalks may pose an increase in risk to older pedestrians, but research on pedestrian injuries has been limited due, in part, to the high cost of visiting collision sites and comparison intersections to collect data on intersection characteristics. 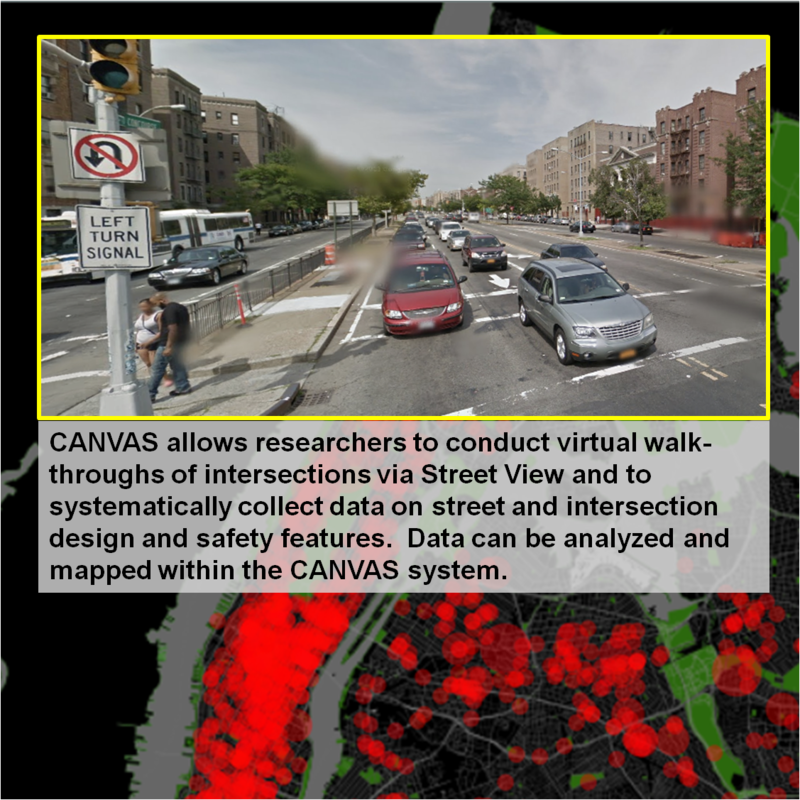 We were recently awarded a pilot grant from the Center for Injury Epidemiology and Prevention at Columbia University Medical Center to investigate the relationship between pedestrian environment characteristics in New York City, as assessed using our CANVAS tool, and the risk of a pedestrian-motor vehicle collision serious enough to warrant a police report. Using CANVAS, we expect to be able to collect data much more efficiently than in-person audits have been able to, unlocking a new data source to understand which intersection modifications can best reduce collisions between cars and people. This entry was posted in CANVAS, Safety, Street View. Bookmark the permalink.